If you check out the current NHL standings, you’ll see that the Buffalo Sabres have more wins than losses. Your eyes are not deceiving you. This is correct. 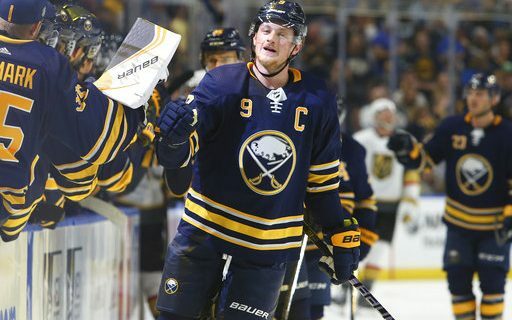 Buffalo earned its second win in three starts in the young season on Monday afternoon, a 4-2 decision over the Vegas Golden Knights before 16,004 at the KeyBank Center. The Sabres haven’t enjoyed the rare air of a winning record since January 2013 – around the time when Barack Obama was sworn in for his second term as President. The Sabres used the same formula for this game that they had in Saturday’s win against the Rangers. Have someone on the top line score two goals, and let the defense give up more shots than the opponents but fewer goals. In this case, the goal-scorer was Jack Eichel, who was the dominant player of the contest. His first goal was a one-timer from the left side that was a blur, and the second came on a nifty goal as he skated down the slot alone. As long as Hutton’s name has come up, he provided quality goaltending for the second straight game. The Sabres only had seven shots on goal in the game’s final 40 minutes as they were on their way to finishing with 17. Vegas had 26 on their way to 37. Get outshot by 20, win by two – somebody is doing some good work back there. Offensively, the Sabres also had contributions from unexpected sources. Scandella’s shot from the blue line hit a Vegas stick and floated through the air with the greatest of ease – not coming to a stop until it found the net. Jason Pominville added a score 88 seconds later to make it a 4-1 game before 30 minutes had elapsed. Pominville has been part of an effective “fourth line” with Evan Rodriguez and Zemgus Girgensons at times this season. After being on the wrong side of .500 for more than five years, no one is putting too much stock in winning two straight games in early October. Yet the Sabres certainly didn’t want to get off to an awful start that would have everyone in and out of the organization thinking, “Here we go again.” The last two wins have put good thoughts in the heads of the players. Buffalo finishes up the homestand Thursday night against Colorado.